The server didn’t seem entirely convinced I knew what I was ordering (he was right, of course) so he warned me, “It’s sort of like a crème brulée.” Say no more, I thought. He proceeded to ask me a series of questions, which I didn’t quite comprehend at first. Not because he was speaking in French, but because this was a whole new world of food, and I lacked context. I eventually figured out that he wanted to know if I’d like a small, medium, or large amount of hot syrup on the thing. Next, did I want the thing in a something-something, or on its own? I really didn’t understand this one, so I just nodded. Let’s go for the whole shebang, I figured. I paid for my thing – along with the plate of delicate pastries I’d gotten for later; this place has the best Lebanese-style baklava in Montreal, despite its unlikely location in a past-its-prime suburban strip mall – and headed to my car. I lowered the paper wrapper and bit into the soft, gooey thing, encased in a crunchy, sesame seed-studded dough pocket with a tiny built-in handle/finger hole. The verdict? This thing was delicious. I’m going to come clean right away. By the time I had the idea to post this recipe, I was sitting at my kitchen table, nearly done eating all the leftovers, and I was too lazy to go get the camera didn’t think the dregs left in the bowl by that point would make for an appealing photo. This recipe is quite flexible, so feel free to adjust the spices to your taste. Don’t like heat? Use mild chili powder. Like a thinner soup? Omit the tortilla pieces. Think cilantro tastes like soap? (I used to!) Don’t use any, or substitute with parsley for some colour. You can even make a vegetarian version by leaving out the chicken and using vegetable stock. This recipe makes about 4 large meal-sized servings or 6 smaller portions. Try it before some enchiladas or tacos for a full, homemade Mexican meal. Heat olive oil on medium-high heat in a large pot on the stove until it shimmers but before it smokes. Add the onion and lower heat to medium. Cook until onion softens slightly, about 5 minutes. Add minced garlic and spice mixture and cook for another few minutes. Add stock, tomatoes, bay leaves, tortilla pieces, and salt. Simmer for about 20 minutes, crushing the tomatoes against the sides of the pot occasionally to help them break down. Add chopped cilantro and simmer another 15 minutes with the cover on. Taste and adjust seasonings – you may want to add more salt at this point. Add juice of 1/2 lime and shredded chicken. Serve with as many optional toppings as you like – or none. It’s flavourful and satisfying on its own. As thousands of my fellow Montrealers descended on downtown decked out in all things green for the annual St. Patrick’s Day parade, I headed out to the countryside with a group of friends for a different ritual: one involving far less alcohol, a lot more sugar, and nary a shamrock in sight. There are a couple of decadent homegrown rituals I usually save for when I’m with people new to Montreal or who are visiting — indulging in poutine is one of them; sugaring off is another. Today’s group brought together lifelong Montrealers with newcomers from the UK, France, Italy, and the United States. As the all-you-can-eat feast began, I gave a heads-up to my end of the table that this was only the savoury start to the meal — the sweets were still to come, so be sure to save room. We worked our way through tureens of split-pea soup and platters of fluffy omelettes, sausages, roasted potatoes, baked beans, thick-sliced ham, pork ribs, and tourtière hand pies — pastry pockets filled with seasoned ground pork and beef. We liberally poured carafes of maple syurp over just about everything. In case that wasn’t enough, there were also fresh rolls, cretons (a seasoned pork spread), coleslaw, pickles, beets, and a chutney-like homemade ketchup. And let’s not forget the oreilles de crisse — a deep-fried pork jowl concoction someone once decided to name after Jesus Christ’s ears, I’m never quite sure why. The table groaned, and I think a few of us did too. Next up: the desserts. Baskets of fluffy apple doughnuts arrived, with little pots of warm caramel sauce to pour over them, because what’s better than fresh-from-the-fryer doughnuts than doughnuts drenched in warm caramel sauce. Platters of pets de soeurs appeared, little swirls of rich pastry filled with brown sugar. When we explained to the out-of-towners that these meant “nun’s farts” there may have been a few giggles — I can’t quite remember, as the sugar coma was starting to set in by then. The tarte au sucre (sugar pie) was a creamy thing of beauty, and I was told the pancakes were ethereal, but I couldn’t manage any. There are a few other sweet maple treats that weren’t served at this cabane — each has its specialties — we missed pouding chomeur (poor man’s pudding — a maple-syrup drenched white cake) and les grands-pères au sirop (grandfathers in syrup — dumplings boiled in maple syrup), but really, who would have had room? After the repast it was time for one last indulgence. We hopped on the tractor and crossed the apple orchard — this farm does double duty — to the steamy maple shack where sap from the trees is boiled down. We stood in line and braved the final sweet tidbit: taffy on the snow, aka tire sur la neige, thickened maple syrup ladeled out on clean snow and twirled around popsicle sticks to make a maple lollipop like no other. And with that final sublime taste of maple on our lips, we all headed home. To a nap for most of us, I suspect. In a secluded corner of a large open field, tucked behind a suburban university residence, lives an oasis of thriving vegetables and herbs. It’s hard to find unless you know exactly where it is and what you’re looking for. I’d even say it’s a secret garden. On summer and early fall Tuesdays and Thursdays, this collective teaching garden opens a teeny farm stand to the public, selling bunches of whatever it has enough of that week. Today there were zucchinis as large as my forearm and delicate bundles of mint. I opted for an imperfect cucumber, a bright yellow summer squash, a wad of yellow and green beans, and some mixed lettuces. Four lonely zucchini blossoms tempted, but I’ll wait for next week when hopefully the crop will be larger – this week’s torrential rain wiped out most of the delicate flowers. With the recent heat and humidity, cooking has not seemed appealing. I’d completely forgotten about the nearby veggie patch; this week’s local crop has inspired me again. Thank you, secret garden. There is no rational explanation for my obsession with party sandwiches. 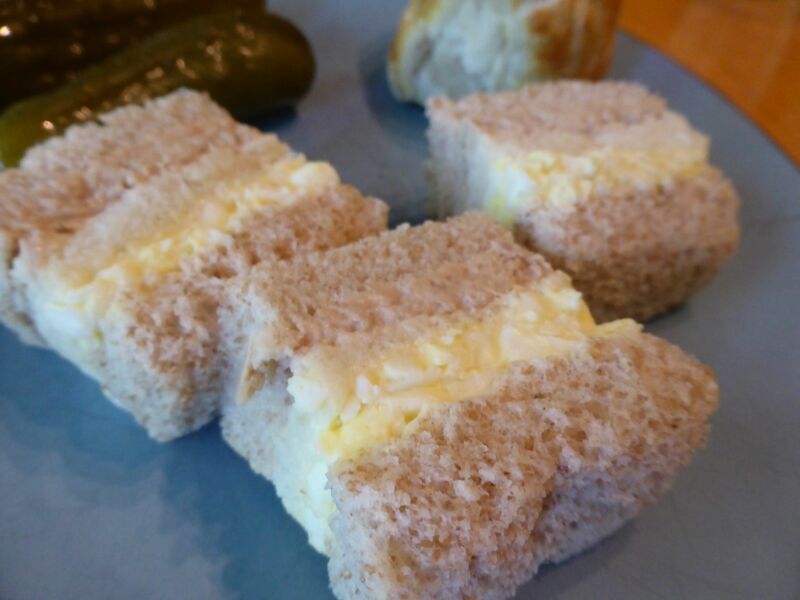 Small rectangles of the most boring soft, crustless white or whole-wheat bread, layered with chopped egg salad or canned tuna or salmon, some in double-decker combinations: there is nothing remotely exciting about party sandwiches. You could easily make them yourself. And yet if you try, they never taste the same. Bland comfort food at its finest, trays of party sandwiches have consoled mourners at post-funeral gatherings in my family ever since I was a child. When my maternal grandmother died I made sure to order plenty for everyone who came to pay their respects. If I’m sick and my tummy is not up for the usual curries or sushi or tacos, I crave a plate of party sandwiches. More recently, party sandwiches have become my go-to travel and pre-trip food. The night before an early flight, they serve as a light supper. Perfect plane food, too. Small and compact, and not too smelly. Party sandwiches are plain. They are unassuming. They don’t make a fuss. In the end, they’re just sandwiches. But like anything that’s greater than the sum of its parts, they’re also so much more.